Clunker? Kruiser? I don’t know. It’s late, matchsticks are propping open my eyes and I’ve spent the night reading about every deck in P.D’s Online Skate Museum when I should’ve been figuring out whether Auckland’s Tim White built his Skull Skates 26″er up as a cruiser or a klunker. 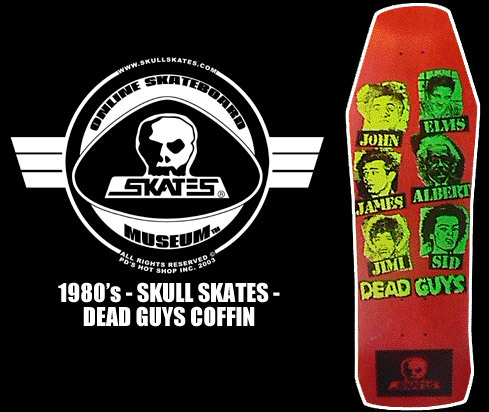 If you grew up skating as well as — or instead of — riding bikes, then you’ll be familiar with the iconoclastic Dead Guys deck by Skull Skates. If you grew up in Vancouver, you must surely be aware of how far-reaching Skull Skates’ countercultural influence was. In 1978, Skull Skates was founded in Regina, Saskatchewan, Canada, by the Ducommun brothers, Rick and Peter (P.D.). P.D.’s Hot Shop is Canada’s oldest skate shop, established in 1976. The Hot Shop and Skull Skates has together created an incomparable legacy. The brothers pushed out a huge catalogue of skate decks and accessories, snowboards, skim boards, and bikes — predominantly BMX and cruisers. The brothers have also promoted musicions and artists, all reflecting their black and white, punked aesthetic. Back to Auckland and Tim, founder of Auckland’s T. White’s Bikes, tells us the story of his Skull Skates Cruiser — a highly sought-after frame by collectors worldwide: “Twenty years ago, I started working at what, at the time, was my dream store, ‘Ride On’, in Vancouver. The owner, Don, was a renowned partier, entrepreneur, and also a mentor of my own path. “The style of bikes that he and his crew rode and procured were 26” cruiser BMX bikes, of which the Cooks Bros frames were the pinnacle. P.D from Skull Skates stopped by the shop often and always had a fresh ride stacked with the high performance parts on what are now ‘grail’ frames: Cook’s, MCS, Powerlite’s etc. — always 26″ers. True to the style, Tim built up his 2nd Generation Skull Skates cruiser frame with a mix of vintage Campagnolo and BMX parts, including a Campy Record front hub, an old Jacky Hayes racing rear hub, a Record rear mech, Gran Sport cranks, Araya 7x rims, GT DX pedals, MAFAC brakes, Renthal motorcross bars, and an ancient Ideale saddle. There’s a whole bunch of history and respect bundled up in this build, spanning generations, styles and genres. Its personal value to Tim is priceless, and he rides it with full knowledge of it, getting sideways around Auckland’s Domain. Huge thanks to Tim for the story and Dylan J Matthews for the photos.